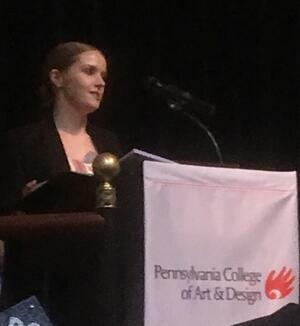 Pfannebecker is a Lancaster attorney whose collection of American arts & crafts is nationally recognized. Pfannebecker is an attorney with the Lancaster law firm of Zimmerman, Pfannebecker, Nuffort & Albert, LLP. He is also the Solicitor for the City of Lancaster and has been involved with government since the 1960s. Early in his legal career, he represented Lancasterians who wished to desegregate several of Lancaster County’s swimming pools. Pfannebecker is Honorary Fellow of the American Crafts Council, has served on the board of the Haystack Mountain School of Crafts, and is a Member of the External Advisory Committee of the International Museum of Ceramic Art at Alfred University. His collection has been exhibited at Moore College of Art, Delaware Center for Contemporary Arts and Cranbrook School of Art. He has served widely as a lecturer, juror and panelist. An interview conducted by famed gallerist Helen Drutt English is in the Archives of American Art of the Smithsonian. 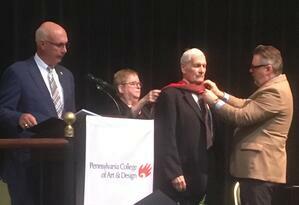 Pfannebecker served as a member of the board of Pennsylvania School of the Arts (now PCA&D) from 1984-87. Pfannebecker said in his remarks, “Early in my professional like I was influenced by an artist and developed an alternative reality…my professional legal life and my life in art.” He encouraged the graduates to do their best work and non-artists to devote themselves to making art an important part of their lives. 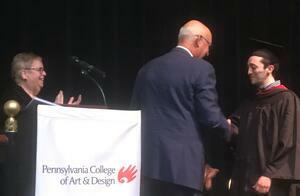 In addition during the Commencement, Robert Brandt, Chairman of the Board of Trustees of the Pennsylvania College of Art & Design, announced that the Board of Trustees unanimously appointed retiring PCA&D President May Colleen Heil as President Emeritus, for her outstanding and distinguished service going beyond the normal duties and responsibilities of the appointment, and which has had an extraordinary impact on the College and the Lancaster community. Heil, who will be retiring June 30, joined PCA&D as President in 1993 and has led the college through its development to an accredited College offering BFA degrees, and has overseen the College’s growth and increased presence in the region. 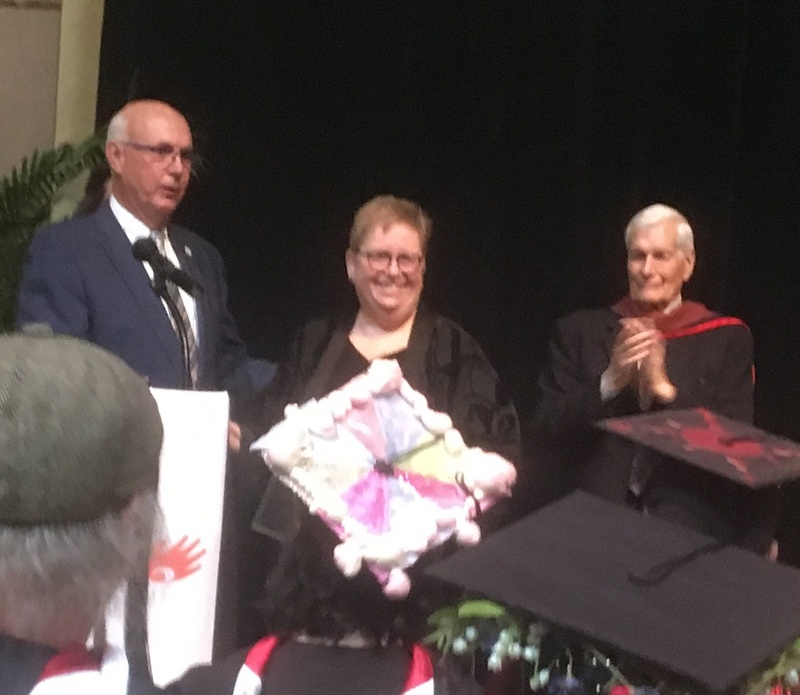 Through her leadership, the College grew from a little-known ten-year old diploma-granting art school to a nationally known 4-year professional art college. Be willing to suffer. Be willing to try and fail; then try and fail some more. Always fight for fair pay, as people in the arts are not known for being fairly paid. Be uncomfortable and never be done learning and pushing yourself. Fake it , until you make it. Leave only 95% of your ego at the door. Keeping a bit of your ego will help make you confident. Trust your gut, Only you know what’s best for you. PCA&D’s graduating students, who so impressed Pfannebecker, received their Bachelor of Fine Arts degrees in one of five majors: illustration, graphic design, fine arts, digital media, and photography, during the May 4th commencement ceremonies. PCA&D’s Senior Show and Celebration: In the evening after Commencement, artwork will fill four floors of the Pennsylvania College of Art & Design on Friday, May 4, for the annual Senior Show and Celebration as the Class of 2018 exhibit professional-level senior thesis projects in a variety of media, the culminating work of PCA&D’s graduates in fine art, illustration, photography and graphic design. Following a Parent’s Preview, the College will open the Senior Show & Celebration to the public from 5 to 8 p.m. The event is the largest annual one-day gallery event in Lancaster. The public is invited to meet the artists, view the artwork and enjoy live music and refreshments. Many works are for sale. 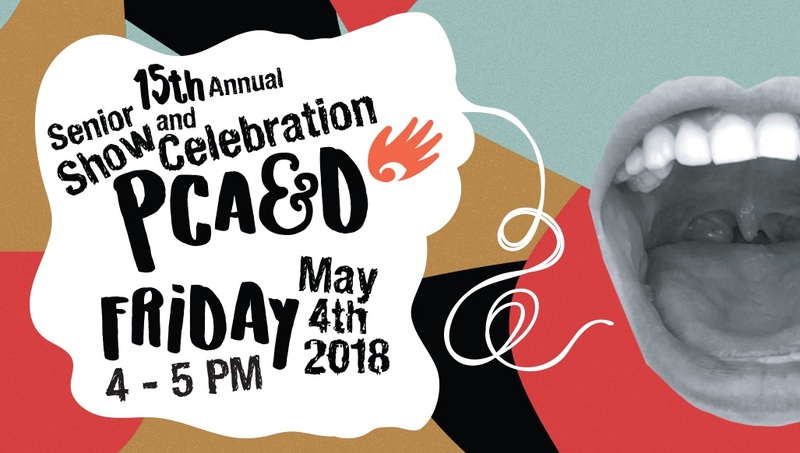 From May 4-26, one work from each member of the Class of 2018 will be featured in the PCA&D Main Gallery. Hours for the exhibit are Monday – Friday from 8 a.m. – 4:30 p.m. (closed Memorial Day). Pinwheels: A total of 100 2.5 foot diameter blue and orange pinwheels, on 6 foot posts, will create a pathway to PCA&D’s Senior Show and Celebration on Friday May 4. The pinwheels, a collaboration between the College and Senior Show sponsors Atomic and Benchmark, will line the freshly graveled path in PCA&D’s Art Garden at the corner of Chestnut and Prince Street, across from the College at 204 N Prince Street, and are being set in place on Thursday, May 3. The pinwheel section, which will be mounted on a 6 foot pole, is 2.5 feet in diameter and takes a minute to assemble. During the Senior Show, a large screen will be placed in the Art Garden, featuring some of the graduating class and displaying artwork from the Class of 2018. 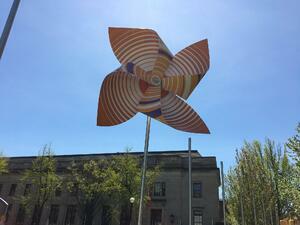 The pinwheels will remain in place through Art Walk weekend.